A chilling, mesmerizing novel that combines the best of modern forensic thrillers with the detail and drama of historical fiction. In medieval Cambridge, England, four children have been murdered. The crimes are immediately blamed on the town’s Jewish community, taken as evidence that Jews sacrifice Christian children in blasphemous ceremonies. To save them from the rioting mob, the king places the Cambridge Jews under his protection and hides them in a castle fortress. King Henry II is no friend of the Jews-or anyone, really-but he is invested in their fate. Without the taxes received from Jewish merchants, his treasuries would go bankrupt. 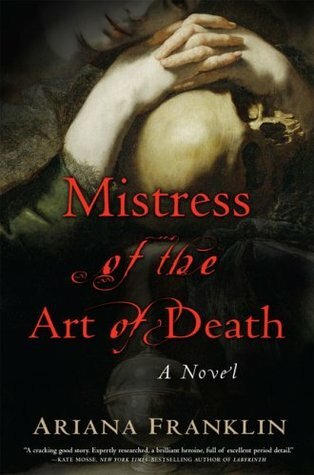 Hoping scientific investigation will exonerate the Jews, Henry calls on his cousin the King of Sicily-whose subjects include the best medical experts in Europe-and asks for his finest “master of the art of death,” an early version of the medical examiner. The Italian doctor chosen for the task is a young prodigy from the University of Salerno. But her name is Adelia-the king has been sent a “mistress” of the art of death. Adelia and her companions-Simon, a Jew, and Mansur, a Moor-travel to England to unravel the mystery of the Cambridge murders, which turn out to be the work of a serial killer, most likely one who has been on Crusade with the king. In a backward and superstitious country like England, Adelia must conceal her true identity as a doctor in order to avoid accusations of witchcraft. Along the way, she is assisted by Sir Rowley Picot, one of the king’s tax collectors, a man with a personal stake in the investigation. Rowley may be a needed friend, or the fiend for whom they are searching. As Adelia’s investigation takes her into Cambridge’s shadowy river paths and behind the closed doors of its churches and nunneries, the hunt intensifies and the killer prepares to strike again . . It sounds fascinating! A woman physician/medical examiner in medieval times, a murder investigation, the status of Jews under Henry II — so many great elements make this book sound like something that will definitely hold my interest. Now that I’ve checked Goodreads, I see that there are three follow-up books — but I’ll start with one and see how it grabs me. I’ve got this one on my shelves too, not quite sure why I haven’t started it yet. If you beat me to it, let me know what you think! great blog… going to spend more time checking it out today, thanks! This sounds fascinating and it isn’t a title (or series) that I’ve come across before. It’s funny – this was a totally accidental find for me, and now I’ve learned that one of my favorite authors gave it a rave review when it came out. I think it was meant to be!